Big ideas often begin in the small dorm rooms of college and university campuses. Everyone knows about Facebook, Harvard University student Mark Zuckerberg’s brainchild. Stanford University’s Larry Page and Sergey Brin launched Google. Babson College’s Abby Speicher is co-founder of a newer startup called DARTdrones, which provides training and support for Unmanned Aerial Systems operators. Then there’s KalMed Kiosk, an enclosed high-tech booth where customers can access a variety of healthcare services, conceived by Middle Georgia State University students Alan Kalinda and Akinyanju Akintunde. But here’s what sets Kalinda and Akintunde apart: they are mere teenagers, students at the University’s Cochran Campus-based Georgia Academy, a residential dual-enrollment program where participants finish high school and associate’s degrees at the same time. Although their idea remains in the planning stages, Kalinda and Akintunde have plenty to show for the extensive amount of time and energy they’ve invested in the kiosk project, all while carrying full class loads as they finish up two-year degrees in Natural Sciences. Their company has a name, Kalinda Healthcare. They have detailed kiosk schematics, mostly designed by Akintunde, the partnership’s Wozniak to Kalinda’s Jobs. Guided by recommendations from various adults who have shown interest, they are pitching KalMed Kiosk to potential investors, sometimes talking to as many as 20 by phone over a weekend. The two conduct ongoing marketing surveys and have costed out a kiosk prototype. They’ve talked to potential vendors that could manufacture the product. While on a trip to Washington, D.C., to participate in a Model African Union event, they filed the necessary paperwork with the U.S. Patent Office to protect their work. All this from two guys barely old enough to drive. Akintunde just turned 18. Kalinda is not quite 17. Both are simultaneously students at Middle Georgia State and Sprayberry High School in Marietta. Akintunde graduates this spring and plans to transfer to Georgia Tech to study Biomedical Engineering. Kalinda will follow his business partner to Georgia Tech after graduating from Middle Georgia State and Sprayberry in 2017. He, too, wants to major in Biomedical Engineering. Both aspire to become physicians. Their youth is sometimes an obstacle in getting business executives and venture capitalists to talk to them, but once they get through by phone or manage a face-to-face, Kalinda and Akintunde almost never fail to impress. Their intricate knowledge of the healthcare industry and the confident way they describe their vision belie their ages. Of course, the idea of a healthcare kiosk is not new. Basically, it’s what you would get by crossing a walk-in clinic and a blood pressure machine like the kind often found in pharmacies, but enhanced with a lot more technological bells and whistles. Kalinda, who talked his pal Akintunde into partnering with him after enrolling at Middle Georgia State that fall, insists KalMed Kiosk takes the idea in new, more innovative directions. Among many other things, patients could get more extensive blood testing to detect prostate cancer and other illnesses. Minor blood tests would take just minutes through a point-of-care diagnostic system. Clients could access their health information through a mobile app. Other KalMed features are a touch-screen control panel for streaming access to a remote medical professional. Equipment on site would include a dermascope, stethoscope, otoscope, pulse oximeter, blood pressure cuff, blood fat percentage prongs and thermometer. Clients could swipe their credit and/or insurance cards at the electronic reader. Anyone donating blood on site would have access to a refreshment “sector” stocked with juice, water, trail mix and granola bars. Blood donors would earn gift cards or be able to give to charities. On-site RNs would staff the kiosks, which the two entrepreneurs envision being placed in groceries, pharmacies and big-box stores. Kalinda and Akintunde also are investigating cost-control measures that would make KalMed more viable than efforts produced by some other companies. As if all of that wasn’t enough, the partners see the kiosk as just one part of a Kalinda Healthcare conglomerate, which would also get into pharmaceutical manufacturing. “It could become the biggest healthcare company in America,” Kalinda said. The two plan to devote themselves to the project full-time over the summer, then kick development up several notches after Akintunde enrolls at Georgia Tech. The comparisons to Zuckerberg flatter them, but Kalinda and Akintunde aren’t about to drop out of college to work on their project, as Facebook’s CEO did. Editor’s Note: To learn more about Middle Georgia State’s Georgia Academy of Arts, Mathematics, Engineering and Sciences, visit http://www.mga.edu/georgia-academy/. Kalinda and Akintunde can be reached at kalmedkiosk@gmail.com. 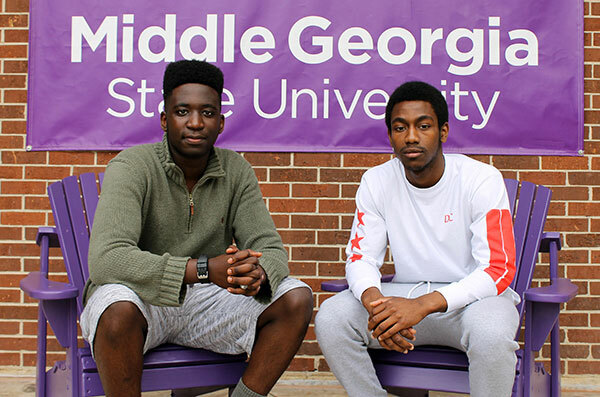 Photo: MGA Georgia Academy students Alan Kalinda, left, and Akinyanju Akintunde.